Draft Report Link - Submit comments about the report electronically, please contact Wendy Rice. Commnets being taken till April 28th. Meeting Video or Commiunity Forum two – Presentation of Strategies and Recommnedations along Gunners Brook. Twenty-five to forty percent of businesses affected by a disaster never reopen. That is an economic impact that residents, businesses, local communities, and Vermont cannot afford. 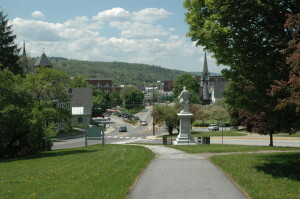 With funding from the US Economic Development Administration (EDA), the Vermont Department of Housing and Community Development, working with the Agencies of Natural Resources and Transportation and the Regional Planning Commissions, launched the Vermont Economic Resiliency Initiative (VERI) to help ensure Vermont remains open for business when disaster strikes. VERI will help the state and local communities by evaluating local flood risk to business and infrastructure, and identify the steps communities and the state can take to minimize rebuilding and recovery costs and ensure businesses stay open — saving jobs and maintaining our economy. In the first phase of the project, the VERI team evaluated and ranked areas where economic activity and associated infrastructure are at high risk of flooding. Based on this state-wide assessment, input from our steering committee and interest from local municipalities, five areas in seven communities (Barre City and Town, Brandon, Brattleboro, Enosburg Village and Town,and Woodstock) were selected for a more detailed analysis of the local flood risks to the community and businesses. This analysis provides the foundation for the team to develop community-tailored action plans to reduce the loss of jobs, inventory, revenue, as well as the cost to repair roads, bridges and other key infrastructure.  ensure residents return to their jobs more quickly and maintain their incomes. Taken together, the local action plans will provide templates to help other Vermont communities better understand the risks and consequences of flooding, and take steps to reduce future damages and disruptions to local businesses. The above introduction and overview were taken from the Vermont Economic Resiliency Initiative page on the Vermont Department of Housing and Community Development website. Click here to learn more. Download a one page information sheet here. Barre City and Barre Town were selected based on a state-wide assessment for a more detailed analysis of local flood risks. Both have a relatively high level of economic activity and a significant amount of vulnerable infrastructure. Barre City has a designated downtown and has 169 vulnerable commercial buildings and Barre Town has 29 vulnerable commercial buildings. Other factors that played a role were the presence of many commercial utility customers in both communities and the location of a state office building in Barre City. 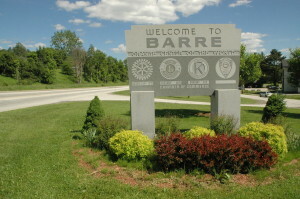 The Agency of Natural Resources suggested that Barre City and Barre Town be studied together because the watershed study area crosses both boundaries. The program will help both communities understand how Gunners Brook moves through developed areas. River scientists will be studying approximately three miles of Gunners Brook, from the Barre Town line to the Stevens Branch in Barre City. Through this analysis, locations within the two municipalities that may be threatened by future flooding will be identified. VERI will offer community leaders and stakeholders guidance to reduce threats to life, property, and employers that can result from flooding and severe weather. Specifically, the VERI team will produce an action plan with strategies to minimize losses and help businesses and communities recover quickly in the event of a flood. We will also provide tailored checklists to reduce risks to specific activities such as farming, municipal operations, or tourism. By participating in the program, Barre City and Barre Town will learn more about the options available to reduce future costs from loss of businesses, or road, culvert, and bridge repair. These options may include methods to better manage stormwater, protect existing capital investments, and maintain the local transportation network. The work in both communities will serve as a model to help other Vermont towns take the necessary steps to reduce the economic impacts of floods. Two community workshops will be held in the next several months– the first in October and the second in January. The first aims to collect information from stakeholders based on past flooding, the recovery process, etc., and the second will be held to share consultant findings from the study on Gunners Brook and to gather input on the strategies that have been identified. Stay tuned for specific dates.